Continuing our weekly assault on North Road restaurants, specifically hard to pronounce Korean joints, Slick, Big D and I made our way to Kimbab Cheonguk. Tucked in one of the many strip malls, this place is well-known for good value as well as tasty eats. Now, if you are a Korean cuisine novice, this might be a confusing place because the menu does not give any English descriptions of the food. However, there are plenty of pictures. So if you are good at picking out ingredients from photographs, than take the plunge! 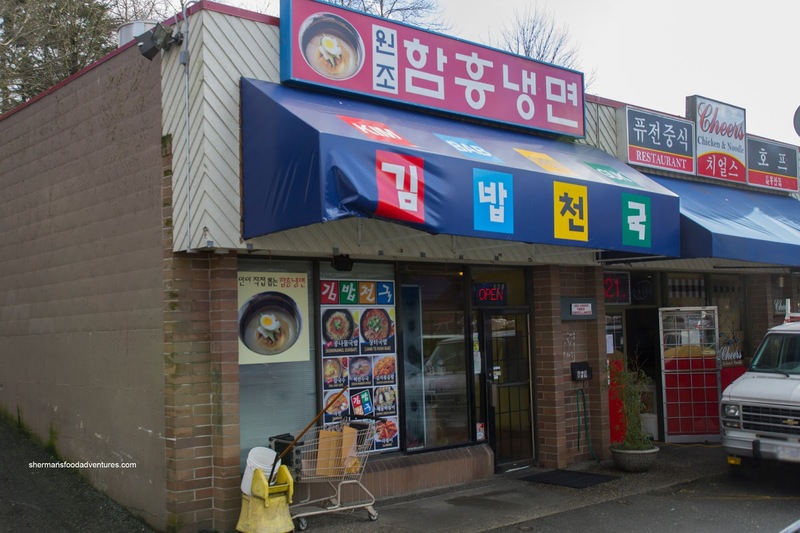 For us, we are pretty well-versed with Korean fare. In fact, Big D is married Korean, so he could be considered an honorary Korean! 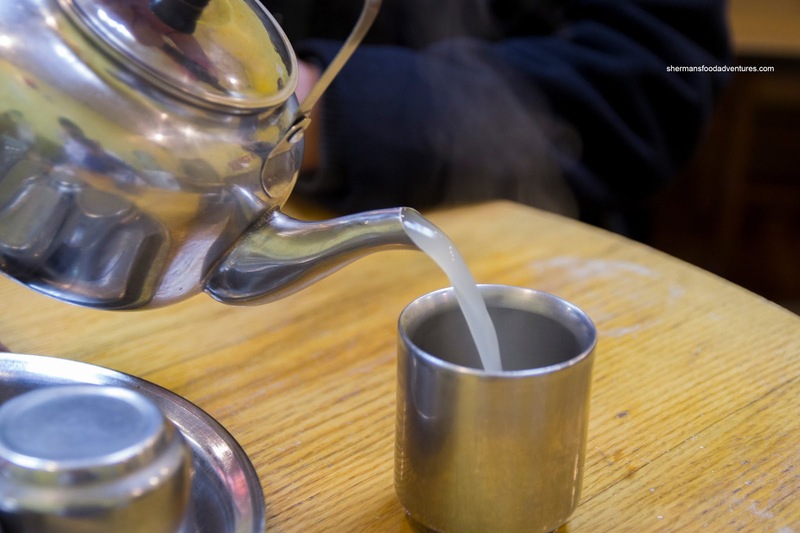 Now, the first thing one would notice about the place is the big pot of tea at the table. Nope. It ain't tea. Look at the picture. Yes, that was Soup pouring out of the spout into the metal cup. And it was hot and tasty too! Now when I mentioned good value, I wasn't kidding. Look at the Kim Bop. That's 2 large rolls for $5.90! 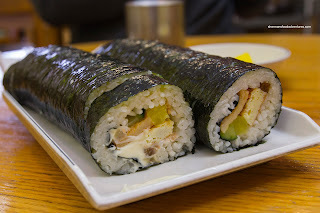 And they were good too with a good balance of ingredients (sorta like the Korean version of a futomaki) and decently textured sushi rice. The Al Bap (Stone Bowl Rice) was fantastic in appearance with the plethora of tobiko on top. Once mixed, the rice had a little of everything from sweet, salty, tangy and spice (when hot sauce was added). I particularly like the rice crust as it was crunchy while not hard. 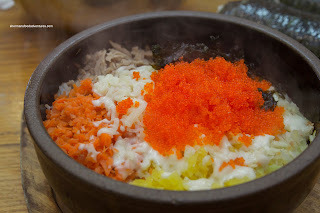 It really want well with the pop of the tobiko as well as the bite from the pickles. I would gladly order this again. 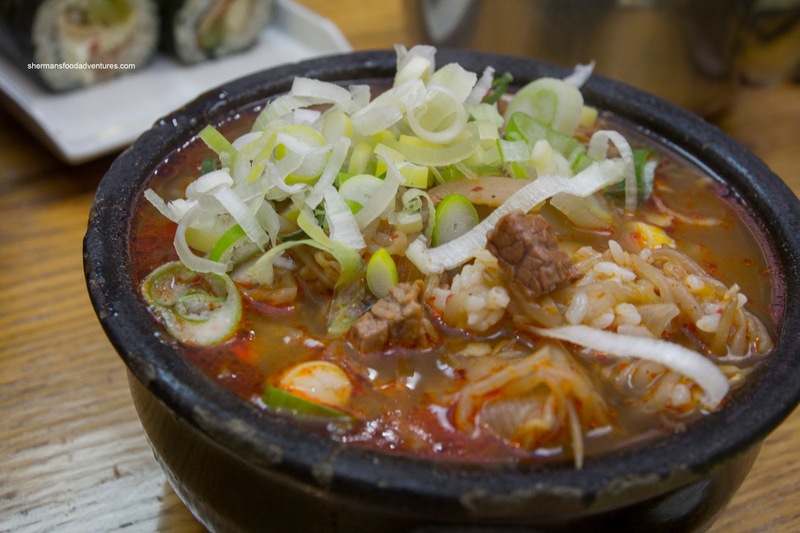 We also got an interesting dish I've personally never had before - Jang Teo Kook Bab, which consisted of rice, sprouts, scallions and beef in a savoury broth. I found it quite flavourful with a meatiness and depth. The meat was moist and with the addition of rice, it was filling. 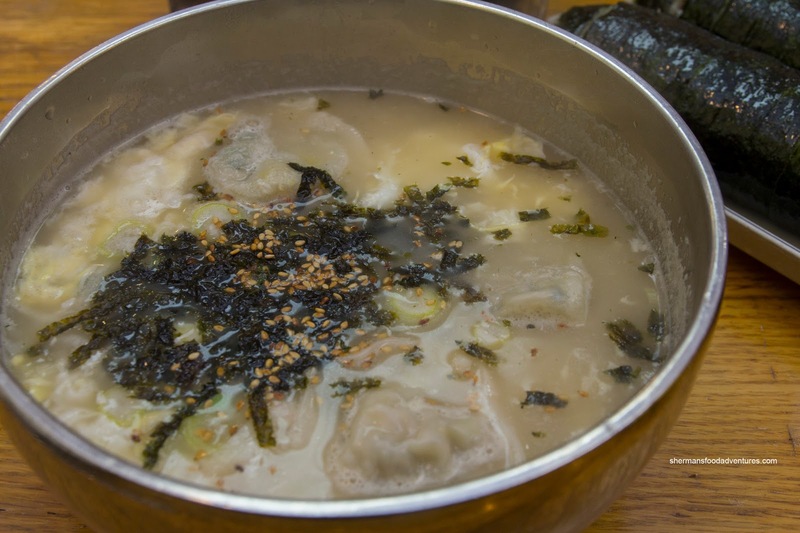 Lastly, we tried the Mandoo Gook which was mild and full of big dumplings filled with glass noodles, meat and veggies. The dumpling skin was soft while still maintaining its shape and integrity. At this point we were pretty stuffed and all for under $30.00 (excluding tip and tax). Definitely one of the best values in town (if you like Korean food that is). This is my favourite place for fresh well made kimbab. Their nangmyeon (cold noodles) is also outstanding and very refreshing in the summertime. The other dishes you had look very good too. Now I have more reasons to visit one of my favourite hole in the wall korean restaurants.